This entry was posted in administration and tagged derby, linux, ReportCaster on December 20, 2018 by rjiang32. This entry was posted in coding, WebFOCUS on August 21, 2018 by rjiang32. What the above does is sets the global variable, &&BOM to the first day of the month. 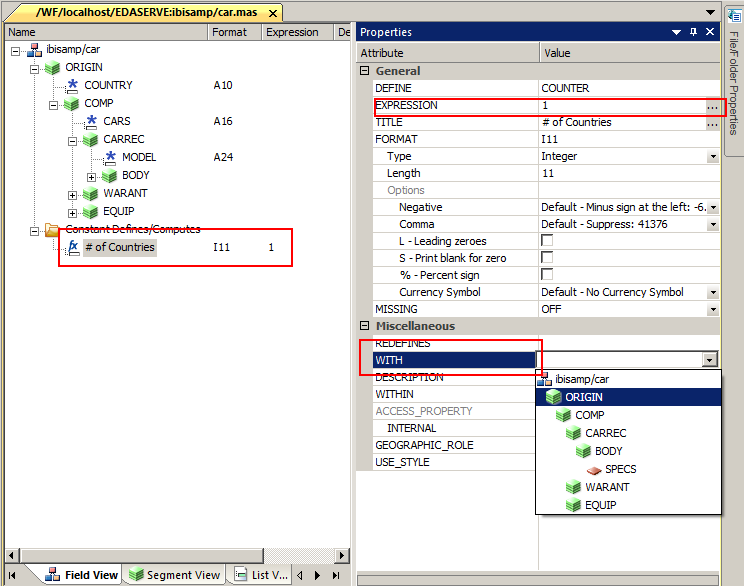 When the user selects “Beginning of Current Month”, it will pass the value “&&BOM” to the WF content. This entry was posted in coding, WebFOCUS on August 13, 2018 by rjiang32. If you want to use a datepicker control in Page designer, there are a couple of steps you have to take. When you add content to a Page, if it has a date parameter, you need to explicitly set the parameters default format. Page Designer will now recognize it as a date type, and will default the parameter control to a datepicker. This entry was posted in Uncategorized on August 13, 2018 by rjiang32. I started working in depth with our synonym (meta data model) editor only recently; there are a lot of neat things you can do with it including adding your own calculated fields, applying friendly names, and casting data types. One common thing you can do is add a counter DEFINE field to the synonym. It’s important when creating this field to ensure that the “WITH” attribute is set to the segment. This entry was posted in WebFOCUS on November 2, 2015 by rjiang32. I’ve highlighted the ‘100’ to show you where you set the limit. This entry was posted in Uncategorized on June 8, 2015 by rjiang32. Official documentation on this can be found here. However, here’s the old technique that will teach you about other built-in functions available. Of course, you can combine this into one big statement, but that would make it hard to read. I’ve also provided a user function so you can reuse it anywhere. You can download it here. This entry was posted in WebFOCUS on April 3, 2015 by rjiang32. I was recently given a WebFOCUS demo to import and perform some testing on it. It was a standard set of assets: data files, .fex files, html files, and various media assets. I came across a problem when I tried to run one of the HTML pages and I was fairly sure there was a problem with how the parameters from the HTML page were being passed to the report it referenced. One of my colleagues showed me a great debugging tip. What this will do is echo out all the amper variables and their associated values. This helped me determine which amper variables (parameters) were causing the issue. Once I figured that out, I went to HTML Composer and fixed the user control binding that was associated with this amper variable. Once my fix was complete, I would uncomment out those two lines to validate that my fix worked. This entry was posted in WebFOCUS on February 12, 2015 by rjiang32. This entry was posted in WebFOCUS on April 12, 2014 by rjiang32. 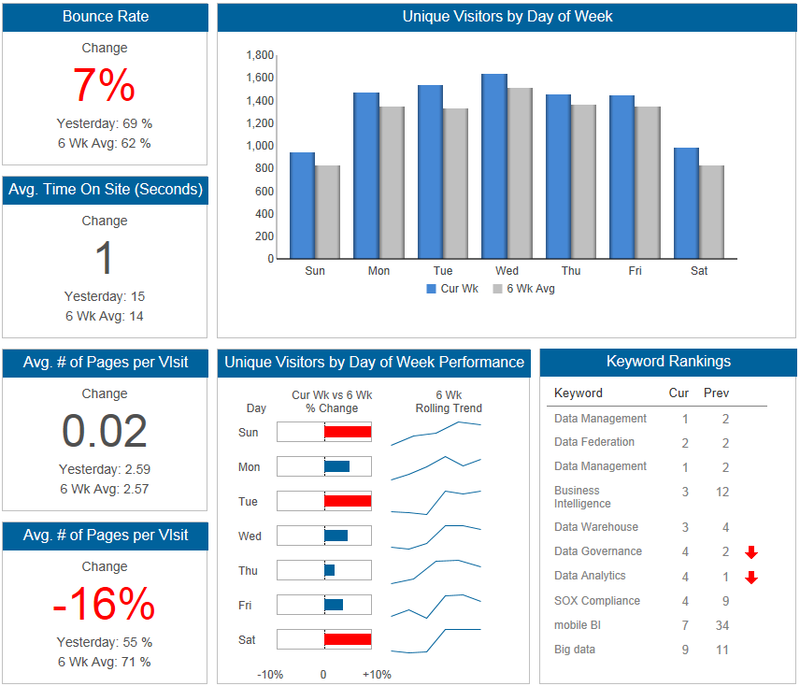 I presented a data visualization and dashboard design workshop back in November of 2013 with a colleague of mine at the Information Builders Toronto office. In the presentation, I showed off a dashboard design that incorporated some of the concepts that we taught in the workshop. My colleague and I will be presenting the workshop at Information Builders 2014 User Conference on Monday June 9th from 2:00PM to 3:00PM. Hopefully, you will have a chance to join us. There are several steps to ensure that the dashboard will run. This section will walk you through them. Download these files and place them in your baseapp folder on your web server. You have the ability to upload Excel files and create synonyms off of them; if you don’t, you’ll have to be creative in how you get the sample data in. This entry was posted in WebFOCUS and tagged dashboard design, WebFOCUS, website operations dashboard on April 10, 2014 by rjiang32.